Our mission is to help IT departments transform the way they service and support employees. With Nexthink, IT departments can create highly productive digital workplaces. Through a unique combination of real-time analytics, instant remediation, automation and employee feedback across all endpoints, Nexthink helps IT teams meet the needs of the modern, fast-changing digital workplace. Nexthink is the only solution to provide enterprises with a way to visualize, act and engage across the entire IT ecosystem to lower IT cost and improve digital employee experience. The inspiration for Nexthink came from an advanced research project in artificial intelligence at the prestigious EPFL (Ecole Polytechnique Fédérale de Lausanne) in Switzerland. One of the outside reviewers, an IT director at a famous watch company, said the research was so innovative that if it could be turned into a product they would buy it. Soon after Nexthink was formed. Two years later that famous watch company became Nexthink’s first customer. 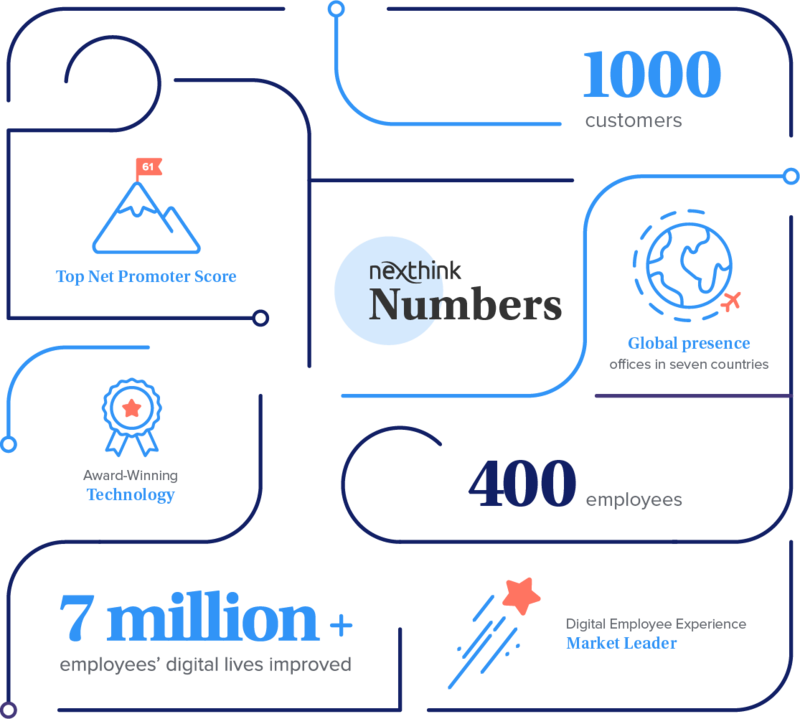 Since then, Nexthink has experienced explosive growth doubling each successive year as IT departments in Global 5000 companies realize that ensuring great digital employee experience translates to bottom line. Nexthinkers engage in nexthinking — the act of forward thinking — applying the latest technology to real problems in a way no one else has. Our employees, partners and customers are all Nexthinkers. They are committed to transforming your IT operations, to making IT departments more efficient and effective and to making employees' IT experience dramatically better. Let a Nexthinker help you reduce incidents by 35%, close issues 60% faster, improve the level of security and compliance where you need it most, avoid costly mistakes on your IT projects, save 20% monitoring your transformation projects, and improve business end-user productivity by as much as 10%.